To use DRM Converter - DRM Remover Software as AA to WAV converter (Audible to WAV converter), select WAV from "Encoder" drop-down list. 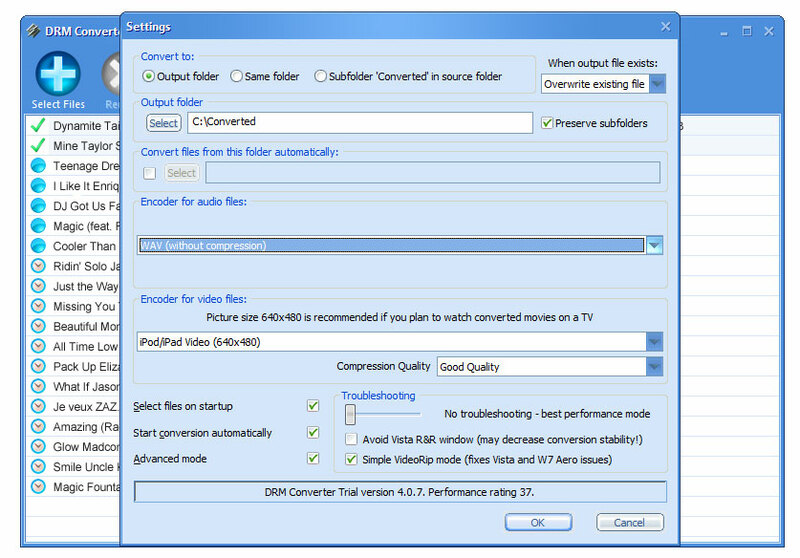 Select AA files (Audible files) for conversion using the "Select Files" button in DRM Converter's main window toolbar (you can use Ctrl or Shift to select two or more files) or using drag&drop (for example from the Windows Explorer). Also you can drag&drop a folder with files or a folder structure. You will see all selected AA files (Audible files) in the DRM Converter's main window. To delete a AA file (Audible file) from this list, select it and click on the "Delete" button in DRM Converter's main window toolbar. Once the AA files (Audible files) are present in your list, click the "Convert" button to convert AA to WAV (convert Audible to WAV). WAV (or WAVE), short for Waveform audio format, is a Microsoft and IBM audio file format standard for storing audio on PCs. Uncompressed WAV files are quite large in size, so, as file sharing over the Internet has become popular, the WAV format has declined in popularity. However, it is still a commonly used, relatively "pure", i.e. lossless, file type, suitable for retaining "first generation" archived files of high quality, or use on a system where high fidelity sound is required and disk space is not restricted.